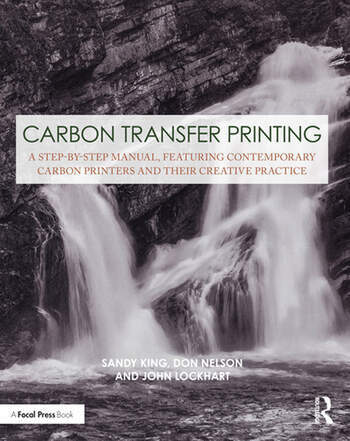 Carbon Transfer Printing is a book about one of the earliest photographic processes that provided the first permanent printing methods, available in one form or another for over 150 years. This book reviews the extensive history of carbon transfer and related pigment processes in both monochrome and color, to serve as point source for a new carbon printer to begin to master the craft of carbon printing, as well as provide new material for experienced carbon printers so they can expand their techniques. The book includes never-before-published information on pre-sensitizing carbon tissue with newly identified compounds, information on the safe use and disposal of hexavalent chromium compounds, and simplified methods of producing 3-color carbon prints. Carbon Transfer Printing is divided into two parts, illustrated with 175 photographs. Part One is a complete how-to on the carbon transfer process, from simple to complex, with a troubleshooting guide and an extensive chapter on digital negatives. Part Two is devoted to contemporary carbon printers who share their methods and secrets to creating their beautiful carbon prints. Carbon Transfer Printing is designed for both the beginning carbon enthusiast as well as for the advanced practitioner. Backed with extensive research on carbon printing from books, journals, and magazine articles from the 1800s to present day, and the extensive personal experience in carbon printing of the authors, there is enough information in this book to provide inspiration and proof of both the glorious past of carbon printmaking and its enduring importance to a new generation of image makers who value the handmade print. Don Nelson has been a large format photographer since 1976, using 8x10, 7x17, and 12x20 inch cameras. Nelson has been an alternative process printer for the past three decades, using primarily carbon and platinum/palladium since 1991, although he has experimented with most alternative processes. "Will be a sought-after reference for carbon printers at all levels, but also collectors, gallerists, curators, and anyone with a keen interest in the history and practice of carbon printing. The book is intelligible and comprehensive on the topic of monochrome carbon transfer; the chapter on color is an added bonus. Carbon transfer can be a daunting undertaking, but the writing exudes good sense, informed by expertise and craftsmanship." "This is a welcome addition to the world of carbon transfer. After printing carbon transfers for more than 14 years I was delighted to discover thought-provoking information and more carbon related issues for me to research. Thank you Sandy King, Don Nelson, and John Lockhart for an amazing epic publication." "The authors of Carbon Transfer Printing have brought extensive personal expertise and knowledge to this publication. This guide to an exquisitely detailed photographic process will provide the photographic artist with a practical means to achieve success. The numerous examples of current printers are an inspiration."